My friends and I went to the Jam Club for the first time on a Wednesday a few months ago. It was great as I saw the small hiphop show where customers competed in a dance-off together. The girl who won was a great dancer, looked great and really enjoyed herself. The Jam Club is a new world for me compared to other clubs in Hanoi and is currently one of the most popular clubs for Hanoi's young folk. I wondered whether their parents know where they are, how much they are spending on drink and clothes. I returned to this club last Friday night with some friends as they wanted to listen to some dance music. 90% of the club's clientele is Vietnamese. My friends had never been to the Jam Club before and they were very surprised about how crowded and crazy it was. This club is kind of a replacement for the New Century Dance Club which used to be in Trang Thi street but was closed down by the police. However, Jam is much much smaller and a bit pricey as well. 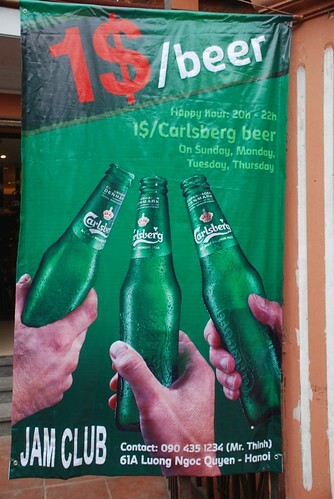 Beer is 50,000Vnd per bottle, with wine and other liquor over the top as well. But most tables seem to have 2 or 3 different kinds of liquors, from Black Label to Gin.... Where do these kids get the money from? Unluckily for us, the Jam Club has $1 Carlsberg beers every sunday, monday, tuesday and thursday... except on wednesday and weekend!!! They don't allow anyone to take photos here or bring alcohol in from outside. Damn! 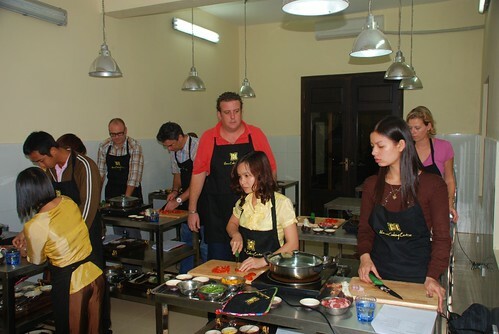 I was invited to join a cooking class at The Hanoi Cooking Centre in Chau Long Street to cook Middle Eastern food for the first time. I have to say, cooking is not an easy job unless you desire to cook. Like most Vietnamese men, I can cook some basic Vietnamese food but going to a class about another cuisine is totally different. It was so interesting to cook something from a part of the world I've never been to and learn some of the basics of cooking, including bread-making. Tracy, the chef instructor showed us her passion for food and her cooking experience. It was very nice meeting her. 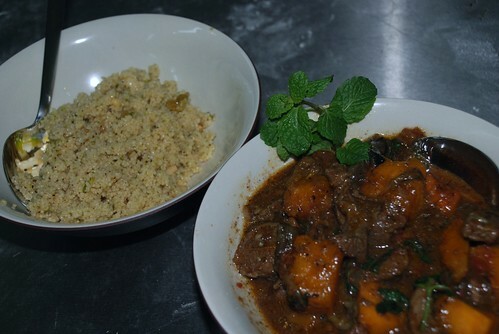 Anyway, the menu consisted of Cinnamon Braised Lamb, Lemon Cous Cous, Baba Ghanoush, Pita Bread and Semolina, Almond and Rosewater Syrup Cake. It took us two hours to finish these dishes. All of the members of the class had a great time making the dishes. By the end, though, I was actually quite physically tired and my arms felt like they has a workout after making heaps of Pita Bread. After the class, we all went upstairs to the bar/cafe area where our table was set up and we tried the results of our hard work. I have to say, I cooked really well that night :) The food was really yummy. Thanks Tracy, thanks to the Hanoi Cooking Centre for giving me a chance to learn and for the nice company on the evening. 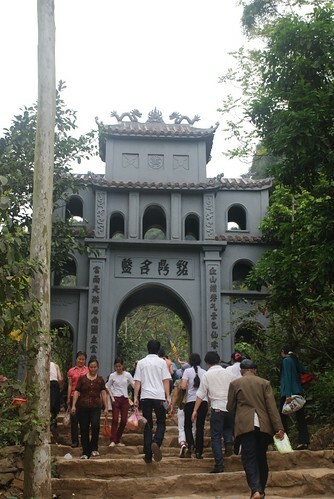 Two weeks ago, my tennis club arranged a day trip to Ninh Binh to visit the Bai Dinh Pagoda. We'd heard that this new, unfinished structure will be the biggest pagoda in South East Asia. The new structure lies behind the old Bai Dinh Pagoda, a 7-minute walk away. The old pagoda is really interesting with a fantastic view from the top. Covering an area of around 700 hectares, the exact location of the pagoda is Gia Sinh Commune, Gia Vien District, Ninh Binh Province in front of the lake. 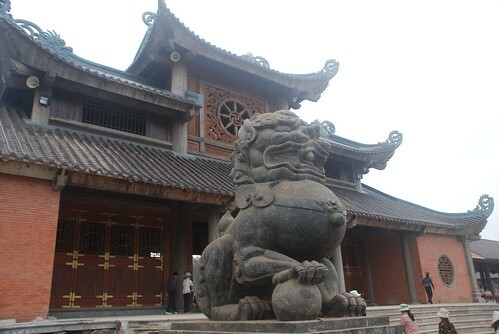 The best locations for pagodas are near water and looking over the surrounding countryside, so the Bai Dinh complex is lucky in both respects. Even though it isn't finished yet, thousands of pilgrims are visiting, particularly as it's still early in the new year.Being among the first to visit a new pagoda is also something to be proud of too. 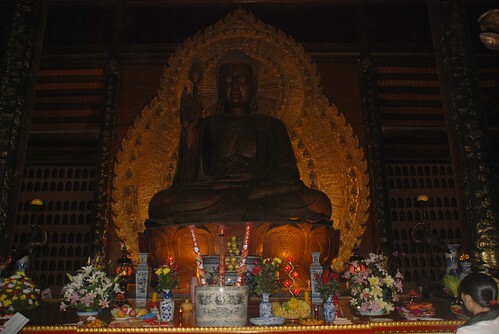 Hundreds of stone statues surround the pagoda in addition to four bronze huge ones, three weighing over 50 tons and one over 100 tons. Another feature is an enormous 36 ton bronze bell. They are all sculpted by Ninh Van, a local craftsman. 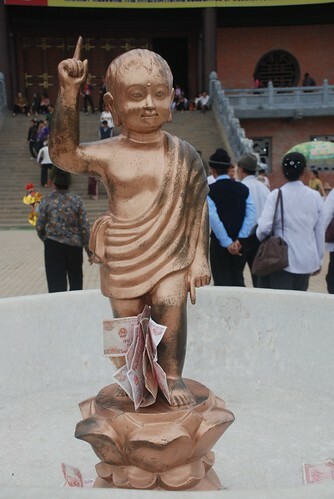 Bai Dinh Pagoda is predicted to become one of the biggest centres for Buddhists in Vietnam. Despite the crowds and the fact that the pagoda is unfinished, it was a really pleasant day in a special place in the fresh country air. I'm hoping to return when it's finished. 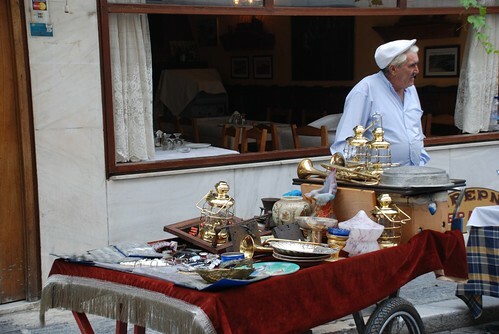 In Greece, I was really surprised that most of the people working restaurants are middle-aged or old men. 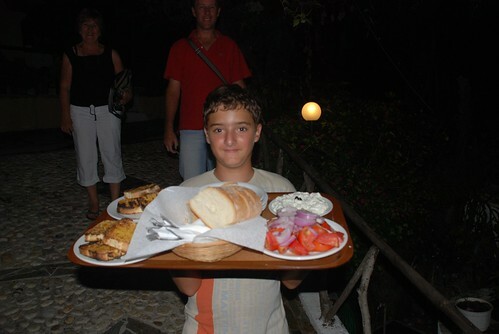 In Asia and maybe in many other countries, waiters and waitresses are recuited young to attract customers but not in Greece. Most people I talked to said that these men have been working in restaurants since then were very young and love that job and don't bother to try different jobs. Of course they are very familiar with everything about their restaurants. They know exactly what to do and where things are. Some of them were very funny. I loved talking to them as they always have different stories to tell you even though some times, I didn't really understand at all. Unfortunately, we experienced some misunderstanding with Greece's tourist information offices, too. The problem was that because we were travelling in the season just after high season, many of the timetables had changed but the office staff were still giving out outdated information. As a result, a few times we missed ferries or buses and this also meant we had to pay for extra accommodation. Oh well, that's something we need to learn and part of the experience for the next trip. 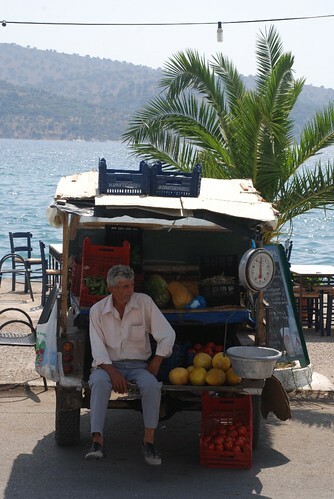 In the shops in Greece, the shop assistants were all interested in Western people but not so interested in me. It was really funny as I was shopping a lot when I was there. A western man or woman would walk past a shop and receive very special greetings but when I walked past these sellers didn't say a thing. Some of them were quite rude but I responded by simply walking out of the shop. They lost my interest but I hope they change their attitude for their future business as Asian people shop alot when they travel as their culture is shopping for souvenirs for their family and friends. 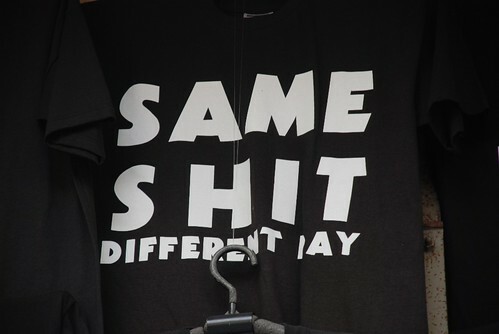 Anyway, been there, done that, bought the T-shirt. Sorry that I haven't updated my blog for a long time. It's been a combination of being busy and laziness. I was actually considering quitting blogging. After 10 days holiday in Hoi An, Ho Chi Minh City and Nha Trang, I decided to start blogging again as I have enough energy now to walk around, take some photos and learn more stories to tell you guys. I went back to Hoi An with my friends for a break to escape Hanoi's awful spring drizzle and dull grey skies. 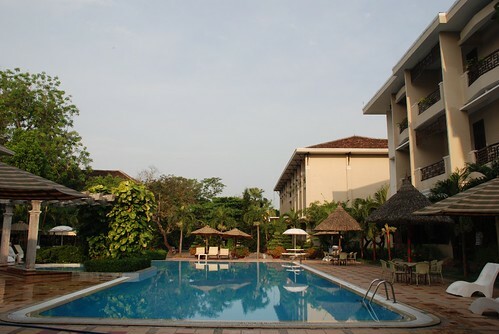 We were greeted in Hoi An by stunning blue skies, a more than warm sun and a really nice hotel. I spent a few hours relaxing by the hotel pool before hitting the shops. My friends hadn't been to Hoi An, so they were excited to see the tailors and lanterns. 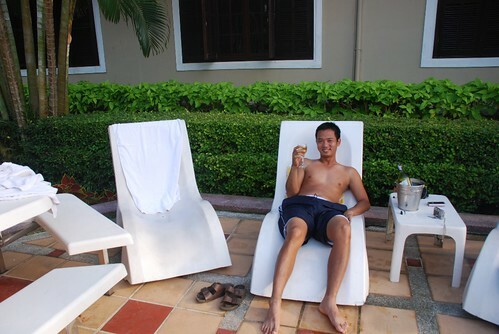 It was actually a nice time to be in Hoi An as there were not many tourists around. During our wanders, we passed a small pagoda in Tran Phu street where food was being served in the courtyard. 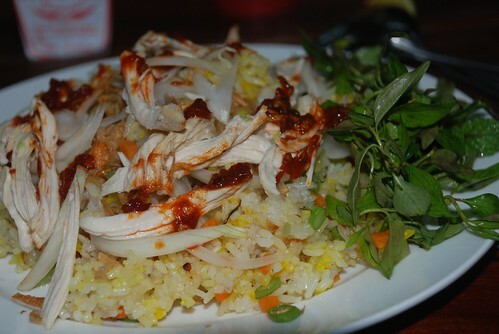 What a fantastic atmosphere to enjoy one of Hoi An's specialties, chicken rice...and one of the local beers, LaRue. Unfortunately, I couldn't find my old tailor after an hour walking around. 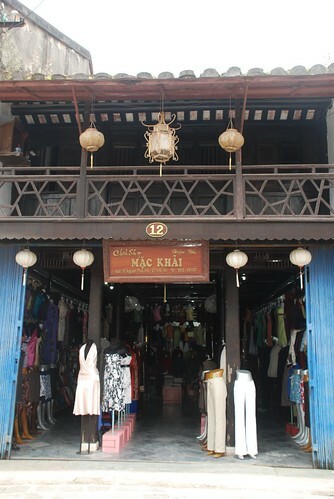 I decided to stop at Mac Khai, one of dozens of tailor shops around Hoi An. I had some shirts and shorts copied to be ready for the hot summer in Hanoi. Within 24 hours, my clothes were ready for pick-up, all perfectly sewn and made to order. The next day we went to the beach for a short time to try some squid, prawns and scallops. They were good but dear compared to Nha Trang. 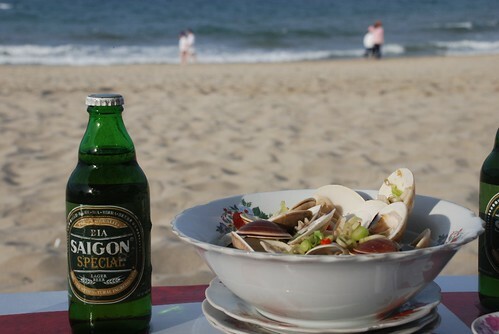 I was looking forward to eating more seafood on my arrival home in Nha Trang. Seafood is always good and cheap down there and that's one of the things I miss most. My friends and I wanted to eat in the night food market which is always full of tourists. It is a good place to try some other local specialties, like the noodle dish cao lau. 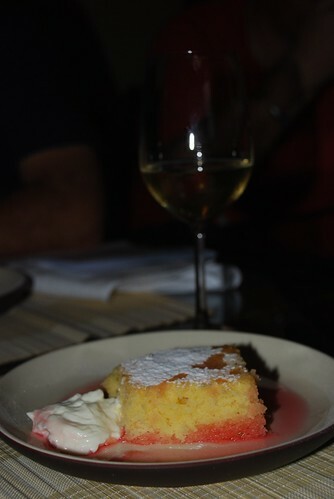 During our visit, we also ate at one of my favourites, the Bale Well restaurant, which I've written about before. Really enjoyed the first leg of our trip.